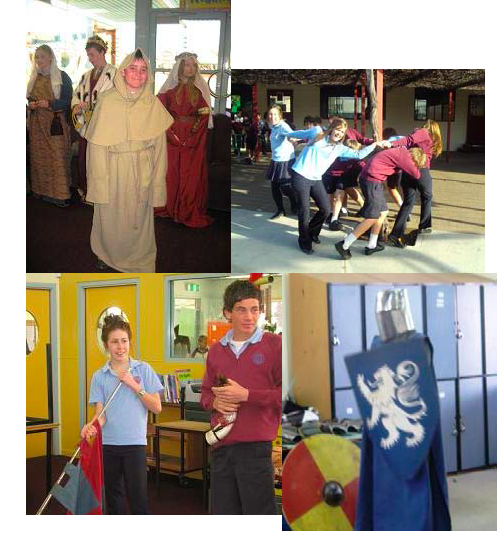 Recently, in Year Eight Humanities, students have enjoyed learning about medieval times. Last week they went on a trip back in time to experience medieval life for themselves. The Melbourne based company ‘History up Close’ came to Galen for a day and delivered three interactive sessions to the students. The sessions covered the topics of Costumes and Lifestyle, Music and Dance and Weapons and Armour. The students thoroughly enjoyed the day as they had a chance to put their knowledge to use and learn more about this fascinating period in history. They got to dress in medieval attire, play musical instruments, learn dances, view weapons of the time and wear medieval-style armour and helmets.